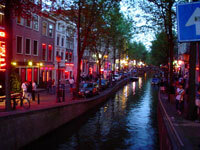 A visit to Amsterdam would not be complete without a stroll around the notorious Red Light District. The atmosphere can be chaotic, with throngs of tourists jostling for space alongside city slickers, pimps and drug dealers. The prostitutes of De Wallen are part of a legal and regulated industry that includes compulsory health checks and taxable income. Prostitution is by no means the only attraction of the area. The district's architecture comprises a scenic mix that dates back to the Middle Ages. Areas to explore include Waterlooplein, Zeedijk and Nieuwmarkt Square. Waterlooplein is the location of the modern City Hall and Muziek Theatre. The square was created in 1880 from two canals that were filled and then allocated to Jewish traders who used to ply their wares on its pavements. Nieuwmarkt Square was also once home to a thriving Jewish community, mainly Portuguese Jews who had fled from persecution during the Spanish Inquisition. The cultural diversity of this area extends to Zeedijk Street, which is often referred to as Chinatown. The street runs from the Saint Olof Chapel to De Waag, and is lined with many excellent bars, restaurants and cafes. Visitors should be respectful and note that photography in and around the actual brothels is frowned on, and could lead to confrontation.